Kansas tight end Mavin Saunders snaps his helmet during practice on Tuesday, April 17, 2018. 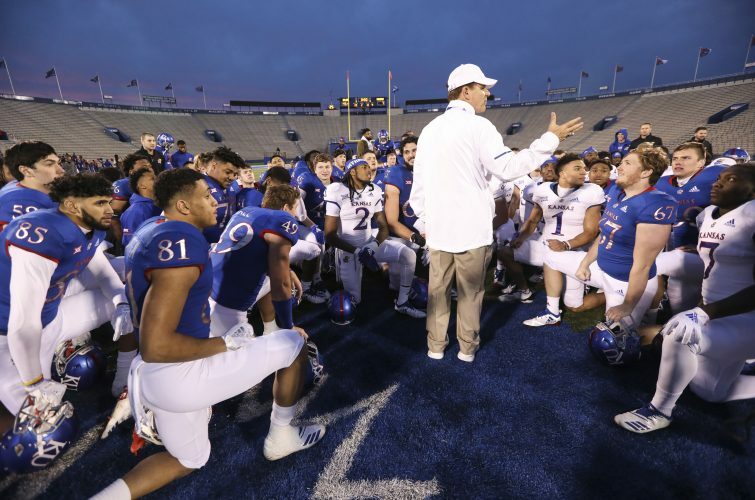 The Associated Press released its midseason All-American team Tuesday afternoon, and not surprisingly, one of David Beaty’s Kansas recruits made the first-team offense. Jace Sternberger, who spent two seasons in the KU program and caught one pass for 5 yards, earned the AP honor at tight end. Beaty raved about Sternberger the day he showed video of and broke down each of the players from his first recruiting class at Kansas. Nothing has changed. Beaty raved about him again Tuesday at his weekly presser. Which then begs the question, of course, why didn’t he get more opportunities to show what he could do in games? 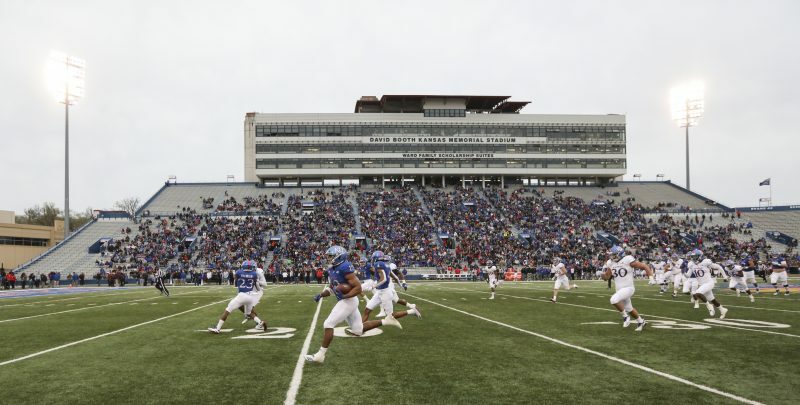 The answer is twofold: Kansas didn’t use a tight end all that often, and when it did, veteran Ben Johnson blocked Sternberger’s path to the field. Still, with a player so talented, even if it meant playing two tight ends, Beaty no doubt would like a do-over on that one. No point in the coach looking back, and no point in him wishing Sternberger anything but the best since Texas A&M isn’t on KU’s schedule. Beaty was receivers coach at Texas A&M, so he has a good feel for the crowds Sternberger is entertaining. As for why Sternberger, a 6-foot-4, 250-pound redshirt junior, left Kansas, Beaty said, “I think just a new start for him. I think all guys go through things in their own career, and they feel they might know what is best for them at the time. At that point, I think he felt like it was better for him to get a fresh start, and it’s worked out for him. Sternberger leads A&M with 29 receptions, 496 receiving yards, an average of 17.1 yards and six touchdown receptions. He’s coming off a career day (seven catches, 145 yards, one TD) in a 26-23 victory at South Carolina. A video of Sternberger going high for a reception and running 27 yards after the catch with a South Carolina defender attached to him has had a lot of eyeballs on it this week. Some of those eyeballs belong to KU football players. Mavin Saunders, a 6-foot-5, 256-pound senior, is a native of Bimini, Bahamas. 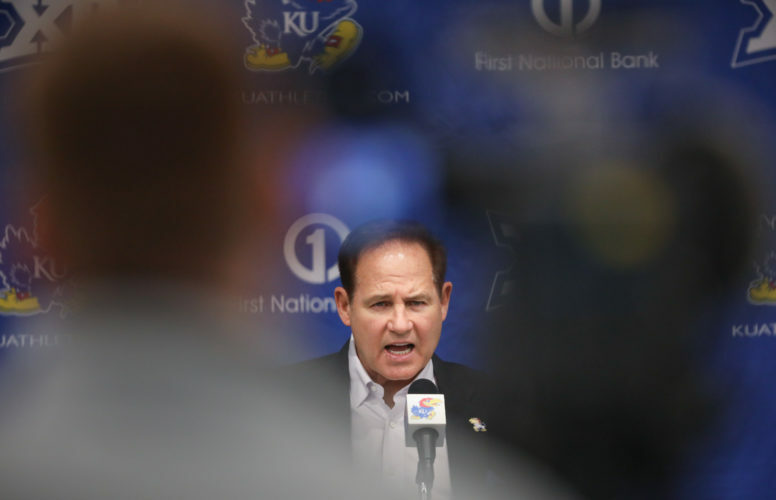 The son of a fisherman and a teacher, he played at Florida State for Jimbo Fisher, and fills the spot that would be Steinberger’s, had the native of Kingfisher, Okla., stayed at KU. Saunders and Sternberger have played for both Beaty and Fisher. Saunders, who has battled injuries throughout his career, is the only KU tight end to catch a pass this season. He has three catches for 24 yards, including an 18-yard touchdown last week at West Virginia. Saunders said he has heard teammates talk about what Sternberger was like during his KU days. Saunders’ opportunities were limited at Florida State, where he never made it to the top of the depth chart. His best season came in 2016 as a sophomore when he caught 10 passes for 182 yards. Saturday’s touchdown was his first since high school. 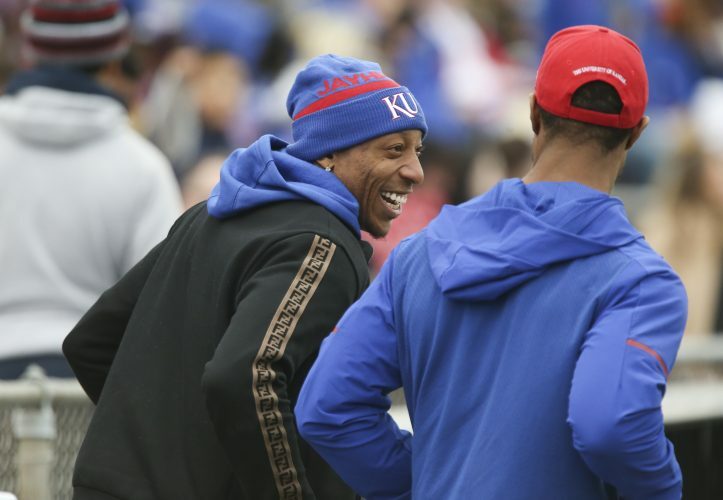 At KU, his opportunities have been limited, even though he’s No. 1 on the depth chart. 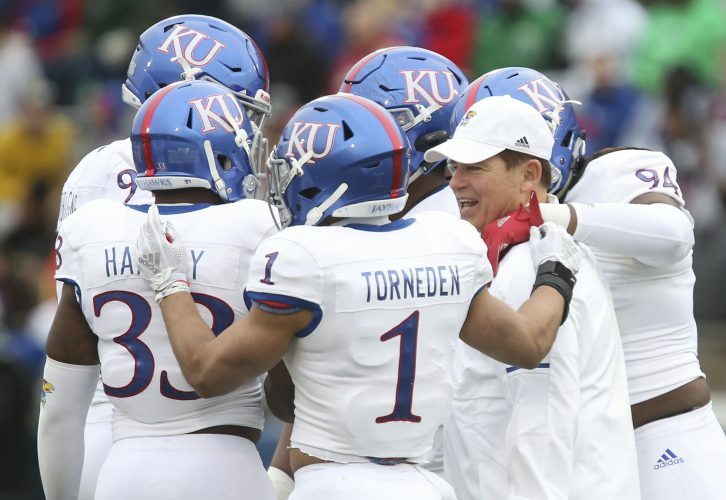 Now that Beaty’s at the controls of the offense for the second time during his four seasons at KU, how much room will there be in the offense for a tight end? Yet, only three catches from the tight end position. Saunders moved to Houston in eighth grade at age 14 and didn’t play football until his junior year. He said he looks up to and studies the film of NFL tight ends who also played basketball. “Those are the guys whose stories I know,” Saunders said. Past and present NFL tight ends who played Division I basketball include Antonio Gates, Jimmy Graham, Martellus Bennett, Julius Thomas, Jordan Cameron and Marcus Pollard. Saunders said his goal is to make an NFL roster and use his platform to encourage children back in Bimini to make getting a college education in the United States their goal. Basketball is the most popular sport in the Bahamas. 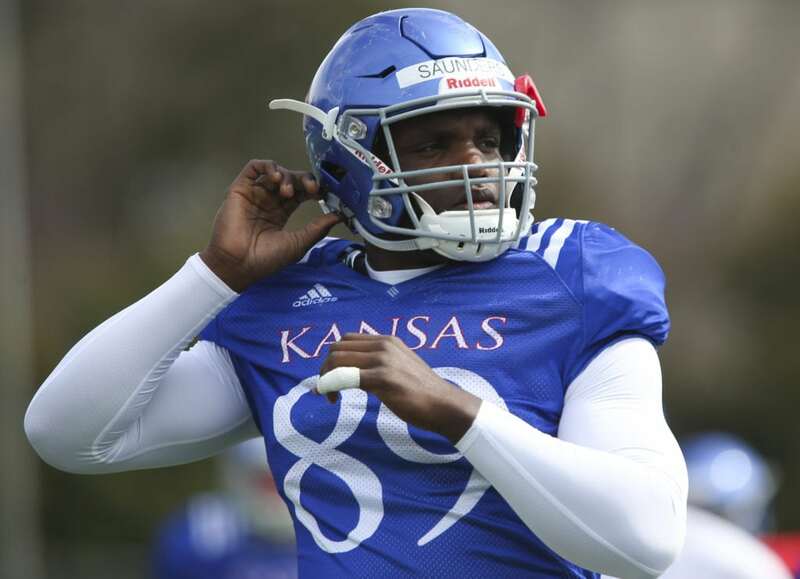 Even though he hasn’t had the chance to play a great deal yet because of KU’s limited use of tight ends, he said he is happy with his decision to transfer. Plus, his touchdown reception vs. West Virginia ended an eight-game touchdown drought for Kansas tight ends. Earl Bostick Jr., an offensive tackle who played tight end for a blink last season, scored on an 8-yard pass versus Texas. Johnson’s TD catch in the opener was the only other one from a tight end in 2017.